THE PICKIEST EATER IN THE WORLD: WIN A TRIP TO CHIANG MAI: NORTHERN THAI CUSINE AT BENJARONG, DUSIT THANI MANILA! 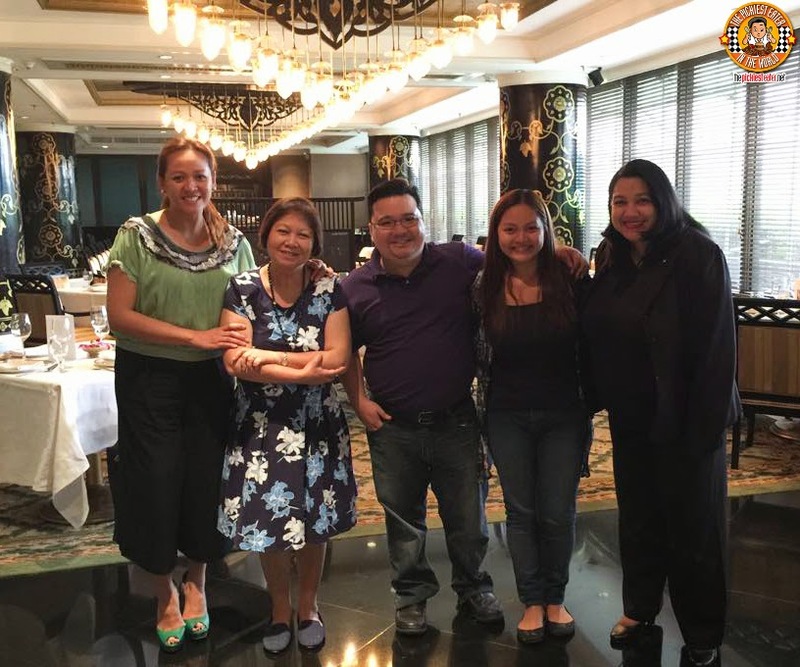 WIN A TRIP TO CHIANG MAI: NORTHERN THAI CUSINE AT BENJARONG, DUSIT THANI MANILA! I still remember the first time I went to Dusit Thani Manila. It was roughly around six years ago, before our blogging days, when I took Rina to their newly opened "Crossover Buffet". The crossover concept allowed me to start my meal at Basix, and literally walk over to their restaurants, Umu (Japanese), Tosca (Italian) and Benjarong (Thai), and grab some dishes from there. 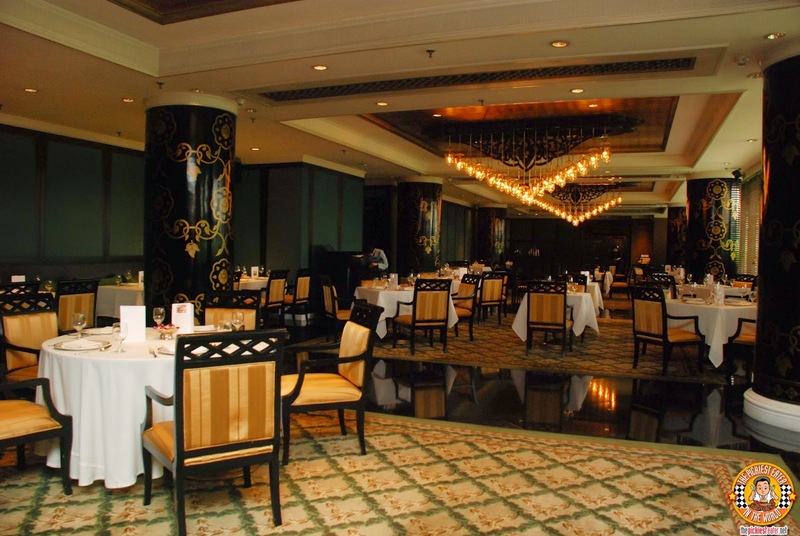 My only problem was that Tosca and Benjarong are both located on the mezzanine floor, meaning in order for me to walk on over there, I would need to climb the lobby staircase. If you have seen me in person, you would know that my body is not made for climbing up on stairs, so I took the elevator. I must admit, I was slightly embarrassed when the elevator door opened to reveal that it was packed with Japanese guests. And there I was, standing in front of them with a plate full of food. They graciously moved aside to make room for me, but you could see they were curious where this little guy was going with all that food. Something I remember very clearly, is the Pad Thai, which was stir fried by this tiny older Thai woman while you wait, was absolutely delicious. In fact, everything I had tried was nothing short of phenomenal, but it was really the Pad Thai that stuck. Just a few days ago, I was elated to finally get an opportunity to return to Dusit Thani Manila. 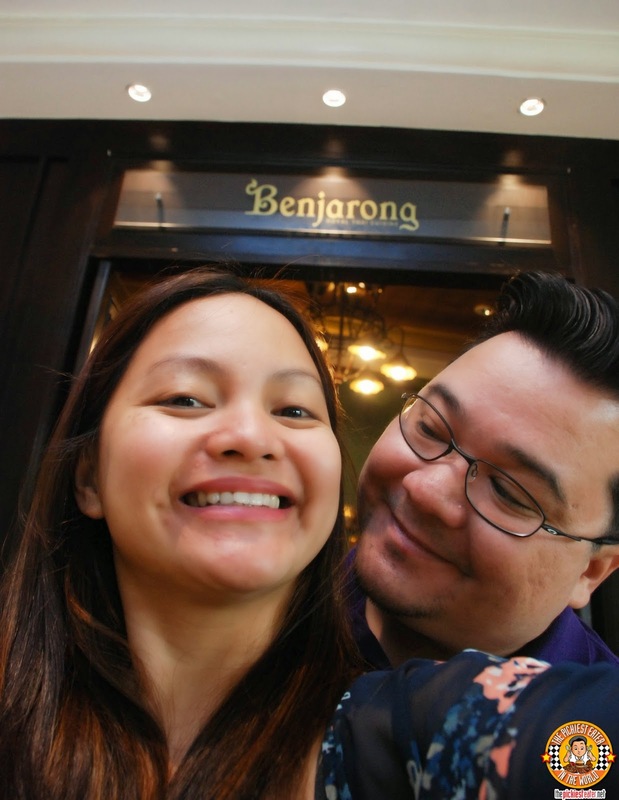 This time, I would be taking our taste buds on a trek to Northern Thailand through the culinary delights of Benjarong! And guess what? They're offering one lucky guest a chance to win a trip to Chiang Mai! 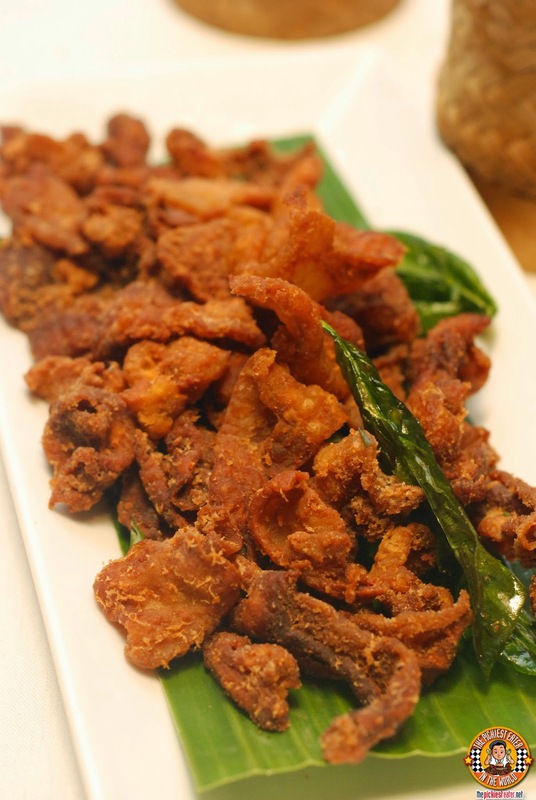 As mentioned, Benjarong is Located at the Mezzanine Floor of Dusit Thani Hotel in Ayala Center. The dining area has a distinct elegance that gives you a taste of the land of the smiles by its traditional Thai decors, yet manages to stay contemporary at the same time. Known for their take on the traditional Thai Dishes, Benjarong has now unveiled a menu filled with dishes that originates from Chiang Mai, Thailand, which will be available for a limited time only. Chiang Mai is located at the Northern part of Thailand, with the flavor profile of the dishes tending to lean on the less spicy, which is a sharp contrast from what we are normally used to when it comes to Thai Food. All guests that dine at Benjarong Royal Thai Restaurant from March 13-22 are eligible to join a raffle, where they may win a ticket to Dusit D 2 in Chiang Mai, Thailand, inclusive of Airfare (Courtesy of Thai Airways!). This way, you can get a first hand experience the sights of the city that Trip Advisor included in their 2014 list of "25 Best Destinations in The World". 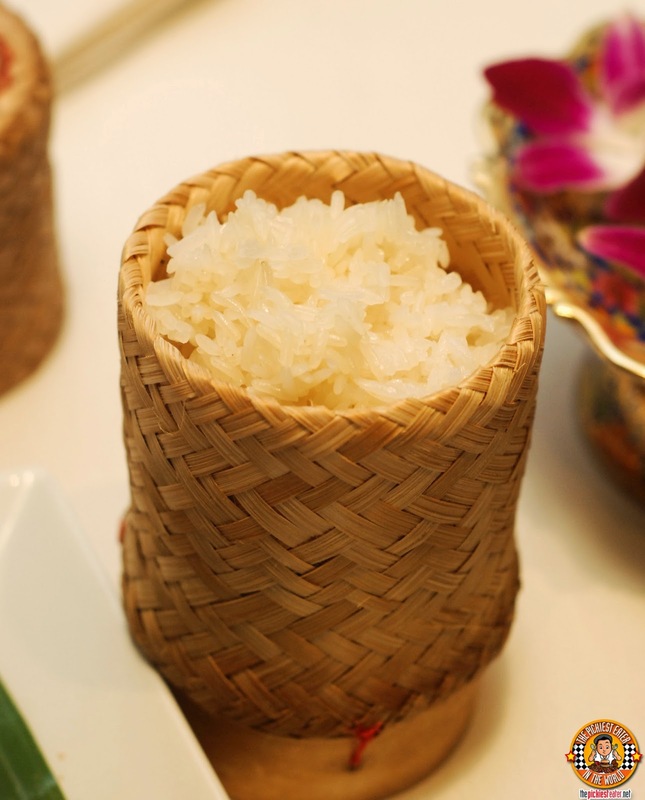 Let me start off by telling you that no Thai meal is complete without eating it with Benjarong's Sticky Rice. This just about ruined every other rice for me, because now I look for the texture and light chewiness when I eat my meal. I used to believe that various flavorful fried rice dishes goes best with Thai food, until I realized that this simple, sticky rice was ultimately the best partner for the other viands that already have bold flavors. 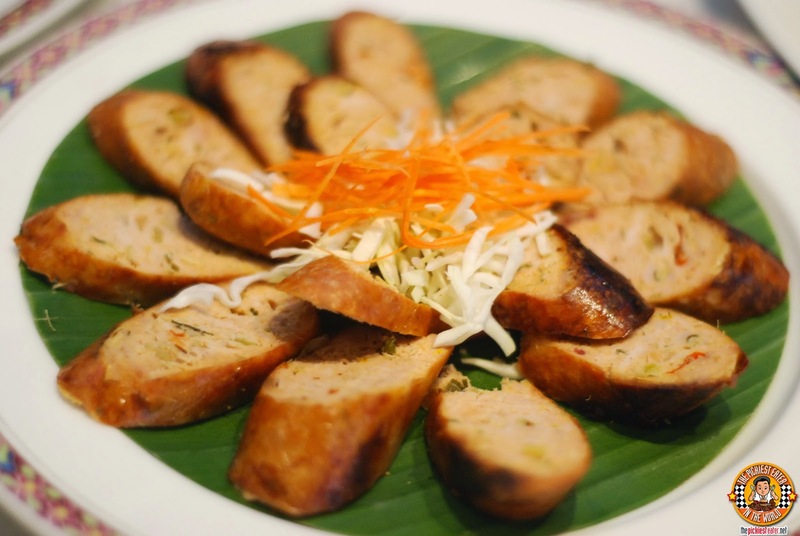 Something very highly recommended to us was the Northern Thai Chicken Sausage, also known as the, Sai Auo Benjarong (P650). The sausage was packed with ground chicken meat and a medley of herbs, giving it a delightfully, meaty flavor, without being too heavy. I think the dish that I ate too much of, was the Nang Gai Tord Khon Meuang (P450). 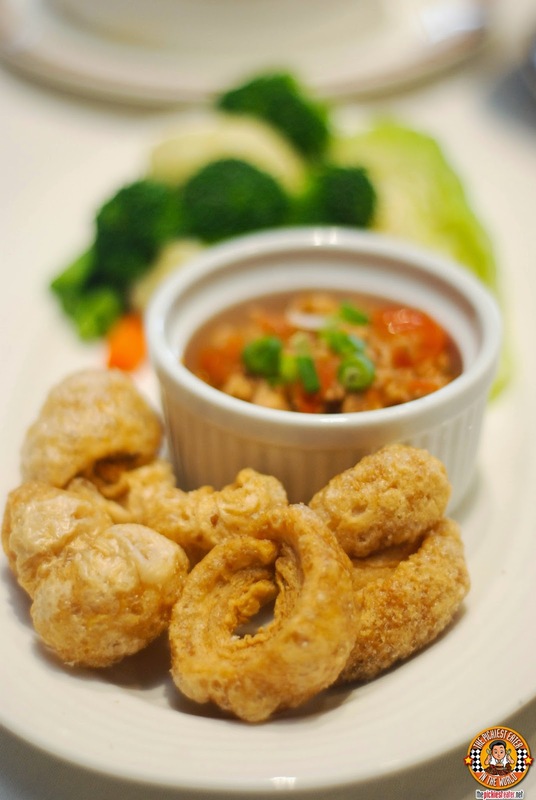 Considering that it's Crispy Chicken Skin with Red Curry, I'm pretty sure you know where I'm coming from. Although I'm not entirely sure where the Red Curry fits in here, I can safely say that this is easily among the best chicken skin dishes I've ever tasted in my life. I believe the pomelo salad is one of the many dishes that I identify most with Thai food. 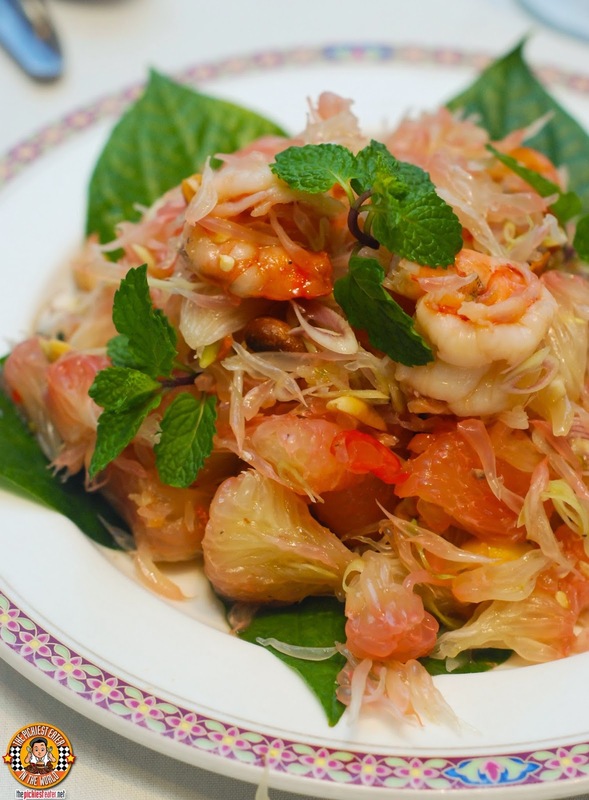 The Tum Som O Gung Sod (P900) is the Northern version which is Pomelo salad peppered with prawn chunks. Rina loved how the sweetness of the Pomelo went well with the prawns.She was, howeber pleasantly surprised by the infusion of heat that never overwhelmed the other flavors. Another dish that Rina enjoyed was the Nam Prik Ong Phak Nung (P450). This was a Chicken and Tomato Dip, that was served with Steamed Vegetables and delicious pork rinds. The Pork Rinds were remarkably delicious even on its own, and it served as the perfect base in which to try the dip. 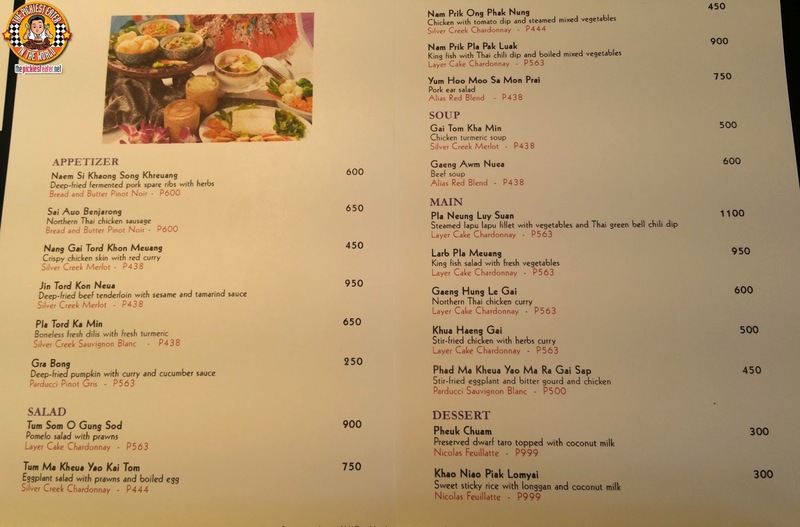 There are two soups available in the Northern Thai Cuisine menu, and the first one I tried, which became my favorite, was the Gaeng Awm Nuea (P600). This was a simple, no frills, clear soup that contains an incredible amount of beefy flavor. 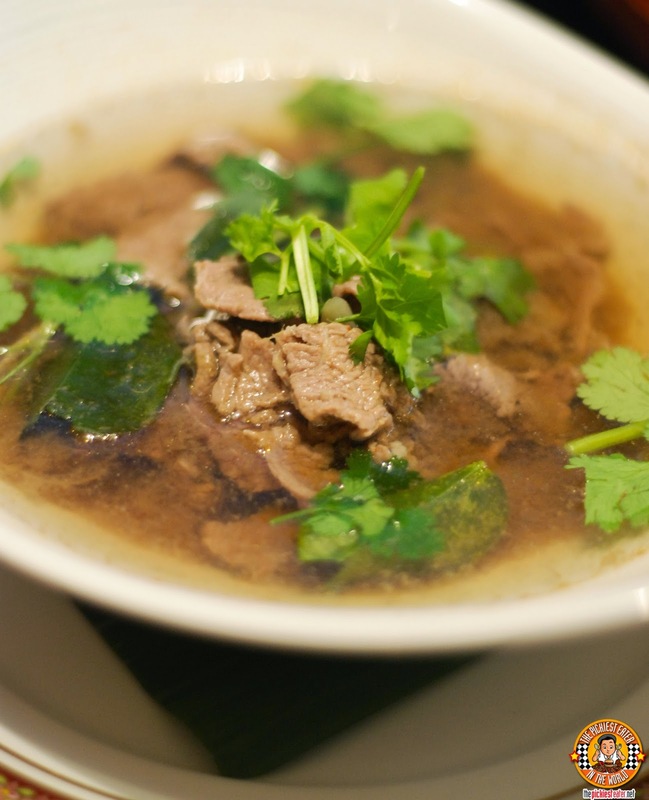 A generous helping of thin slices beef slices swims inside a flavorful broth, making for quite the hearty broth. I personally enjoyed pouring the soup unto the rice and eating it with the beef. It was sort of like our local Beef Nilaga, but with a tad bit more fragrance. Rina preferred the Gai Tom Kai Min (P500). If I compared the Gaeng Awm Nuea to Nilaga, Rina's felt this reminded her of Sinigang. This is a thin, Chicken soup with a touch of Tumeric. 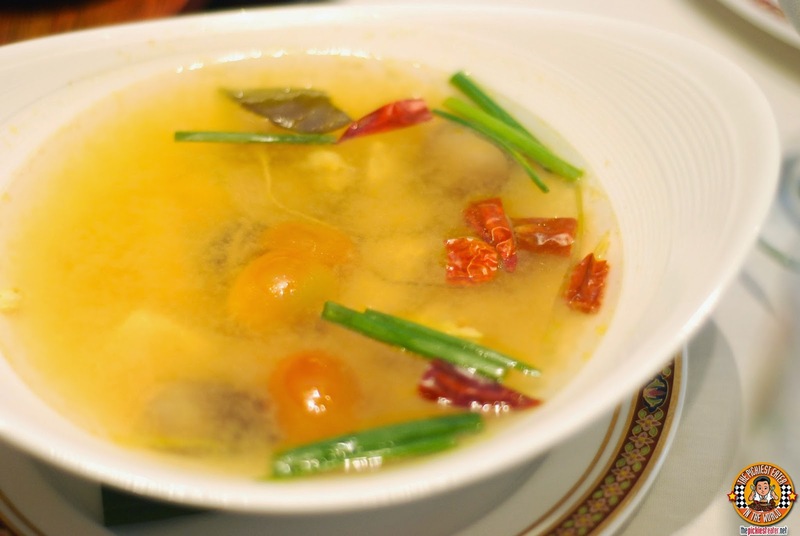 There was a touch of acid and enough sourness in the broth to keep your taste buds curious. The floating bits of chili adds an element of heat to those that look for spiciness in their soup. I was really amazed with the Gaeng Hung Le Gai (P500), which is the Northern version of Thai Chicken Curry. Don't let the hue of the fiery red sauce fool you.. This isn't a spicy dish.. AT ALL. The cuts of chicken that were bathed in the rich curry sauce was very moist and tender, and I couldn't resist eating one bite after another, especially when the sauce was mixed with the sticky rice! This marked a special day for me, because this was the first time that I ate an Ampalaya dish. 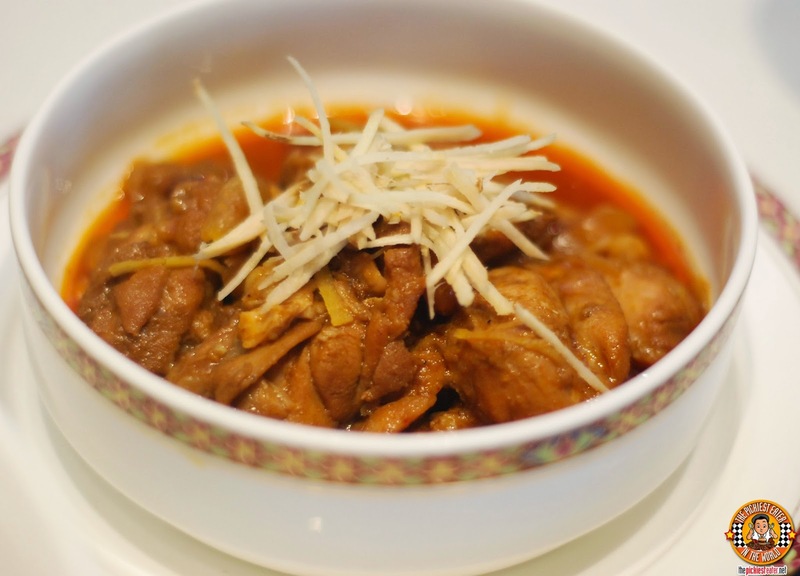 Come to think of it, I honestly can't remember the last time I enjoyed a dish with "Bitter gourd" in it. But I can safely say that I am a fan of the Phad Ma Kheua Yao Ma Ra Gai Sap (P450). This was stir fried eggplant, mixed with minced chicken and bitter gourd. Again, mixing everything with the sticky rice allows for some magical things to happen with your taste buds. 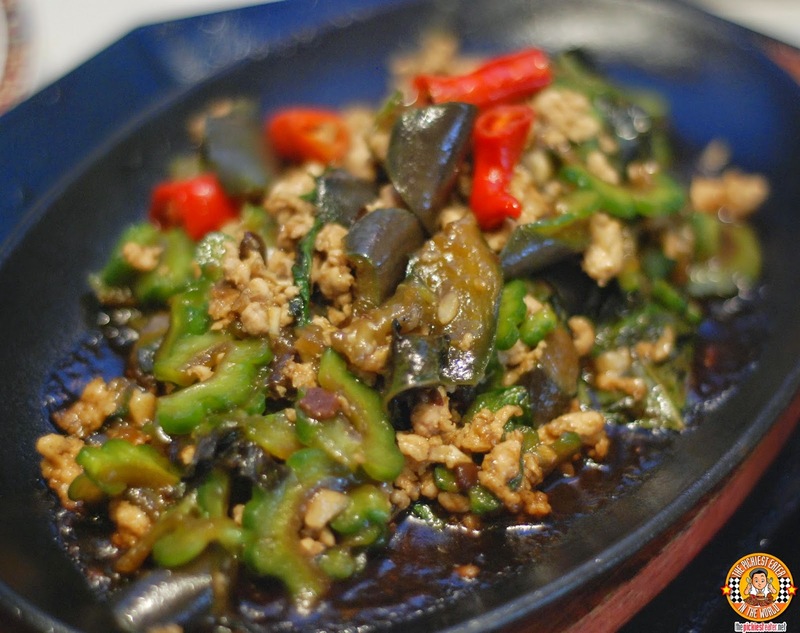 The dish also has some chili slices for those who feel that like their Thai food with a kick of heat. For our dessert, we tasted the Pheuk Cham (P300), which was Preserved Dwarf Taro Topped with Coconut Milk. Despite the fact that I've never been a huge fan of Taro, I found this to be quite tasty. However, once I tried the Khao Niao Piak Lomyai (P300), I decided that my remaining stomach space would be dedicated to this. 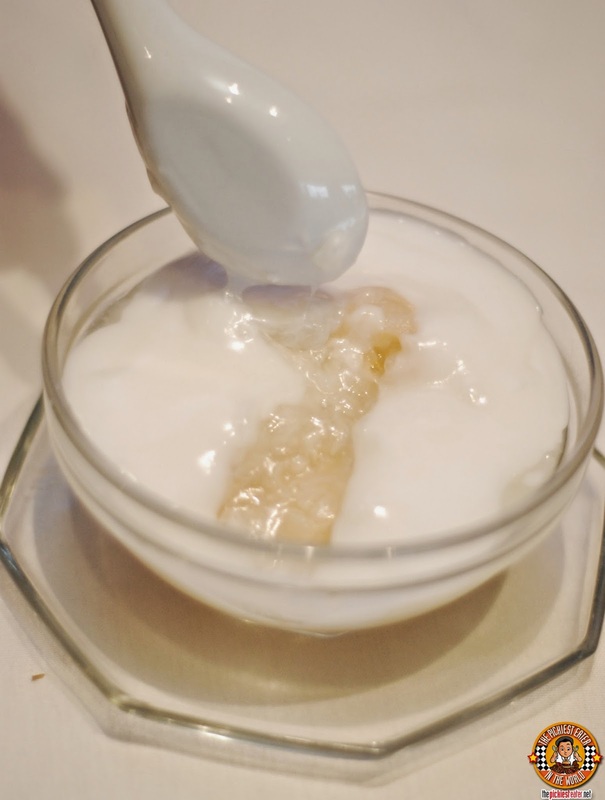 This almost porridge like sticky, sweet rice, with bits of Longan and doused with creamy Coconut Milk was so addicting, I could have finished two bowls all to myself. Definitely, a memorable way to cap off a fantastic meal. 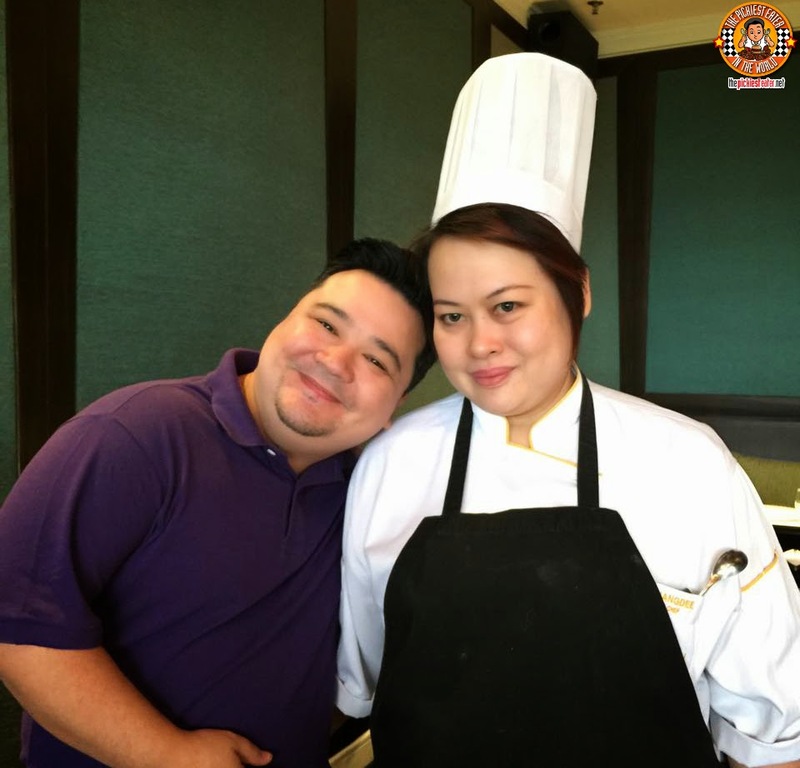 It was an honor to meet the woman behind the kitchen of Benjarong, Chef Suwanna Puangdee! Her Northern menu shows her diverse skills in art of Cooking the Thai cuisine. After standing up from our Nothern Thai Feast, my shirt suddenly felt like it was two sizes smaller, slightly creaking at the seams with my every movement. Thank you Shariza and Lizel for the wonderful afternoon of food and kwentuhan.. We felt like we were in the company of long lost friends! This is without a doubt the kind of natural, feel-at-home hospitality one can expect from Dusit Thani Manila. The Northern Thai menu is only available from March 13-22. Call +6322388888 for further inquiries on the Benjarong Promo. Follow Dusit Thani Manila on Facebook!